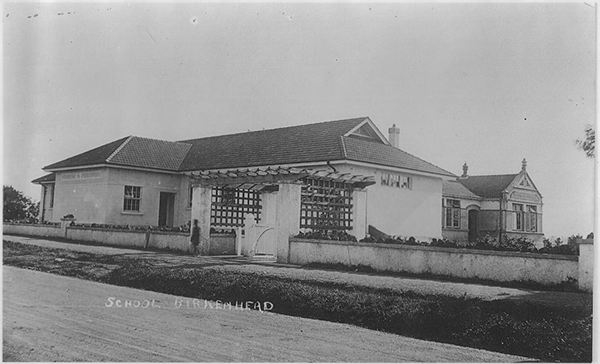 During the early 1900s, numerous petitions were lodged, asking for a permanent school for Birkenhead residents. In 1913, some land on Roberts Road (now Mokoia Road) was purchased by the Education Road. Later, in 1914, a portion of Edward Skeate’s Highbury Estate was bought for the primary school. However, the school was not actually built until 1919, due to a lack of funds and the intervention of the First World War. Despite the rest of the original school having been replaced by new school buildings, the lychgate and fence still stand as a nod to the history of the school. This particular lychgate (also known as a lynchgate and lichgate) is a more modern interpretation of a British tradition. Originally, lichgates were erected at the entrance to churches and served as the location and shelter for the first part of a funeral ceremony, as the body was carried into the church grounds. Lychgates also have links to spiritual purposes, such as warding off evil spirits. However, this lychgate could also have been used a form of shelter for the parents of the children, as well the children themselves, at times of inclement weather.